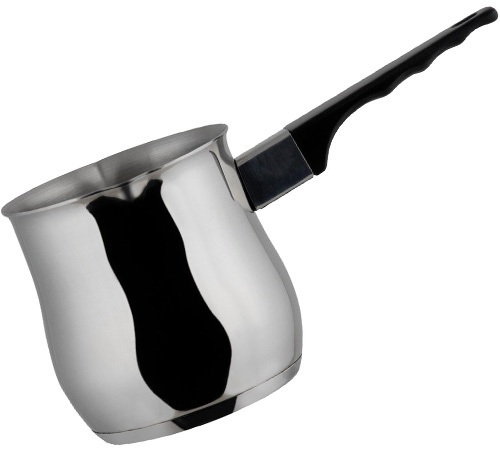 Authentic Turkish coffee maker with a capacity of 350ml (4 cups), made from 18/10 stainless steel, by the Ilsa brand. Coffee maker compatible with induction hobs. PLEASE NOTE : A small pot on a larger induction plate will generate less power. Therefore, the induction element may not activate nor function properly if the cookware is too small. ILSA was founded in 1946 under the company name of Industria Laminazione Stampaggio Alluminio (factory for rolling and pressing aluminum). The first ILSA-branded product to be launched was the Neapolitan coffee maker! ILSA is an internationally recognised company in the tableware, coffee maker, milk container and professional catering sectors. Quality and design is the motto for this family business! Authentic Turkish coffee maker (Cezve/Ibrik) with a 2 litre capacity, made from 18/10 stainless steel, by the Ilsa brand. Compatible with all hobs except induction.